A friend asked me to post a picture of my desk after yesterday's blog entry about Organizing Work Space. I felt a bit dirty (hence the title of this post), but here it is, for everyone to see. My desk, untouched, with today's piles in all their glory. 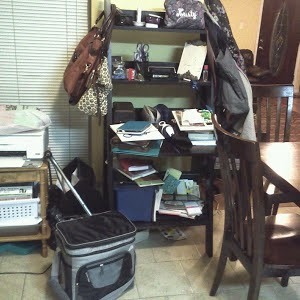 And now you know that even a person who blogs about organizing has imperfections. Feel better about your own mess? I could not stop laughing! OMG - that reminds me of what I end up with - always thinking "I need more space!" but hubby rolls eyes and says that's not the problem! Well, you'll get it all organized again.